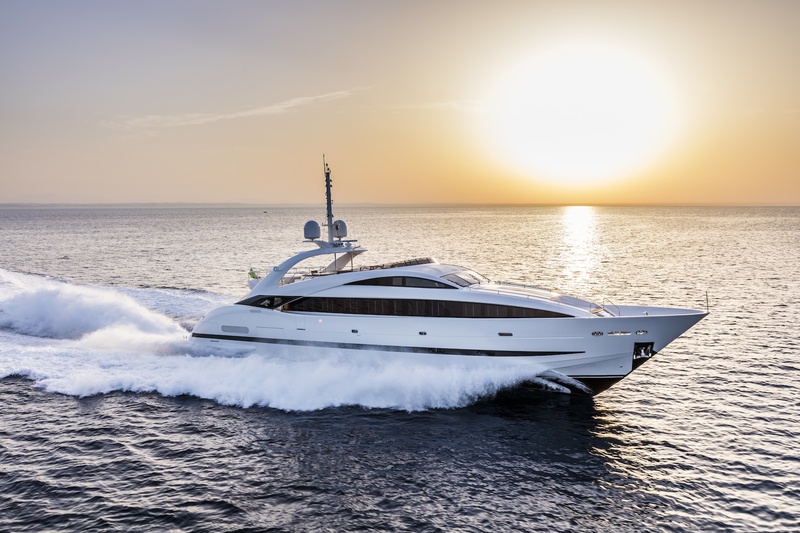 The hull #11 of the renowned superyacht ISA Sport 120 range is ready for her official debut at the upcoming international boat shows in Cannes and Monaco. 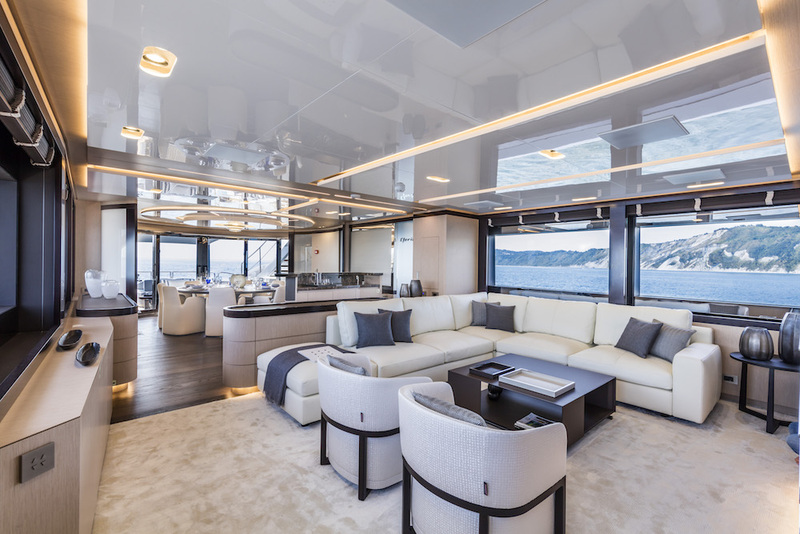 Launched in Ancona in July 2017, the 37-metre superyacht from the Italian shipyard marks a true transition towards a completely renewed course of the brand. 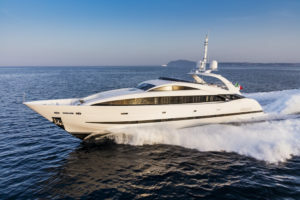 Less than a year after the acquisition of ISA Yachts by the Palumbo Group, ‘Clorinda’, whose construction began in 2016, is the first yacht completed in the Ancona yard under the new ownership. ‘Clorinda’ represents an evolution of the 10 previous units of the series, and stands out for the introduction of restyled design elements, such as the dark fashion plates with glass inserts or the grey bottom line, and new functional ones, like a further fore solarium, and a skylight with blind to provide the master stateroom with even more air and light. ISA Sport 120 comes from a whole project and design aimed at meeting the requirements of a yacht owner who loves elegance and performance, along with large exterior spaces and the inside comfort of a one-and-a-half decker cruiser. The architectural framework is conceived to enhance the relation with the environment and to enlarge the deck areas in contact with water and exposed to sunshine. The proportion between exterior and interior spaces is extremely balanced, with large terraces above the sea, spacious cockpit and flying bridge on one hand, and a huge and bright salon and ample cabins on the other hand. 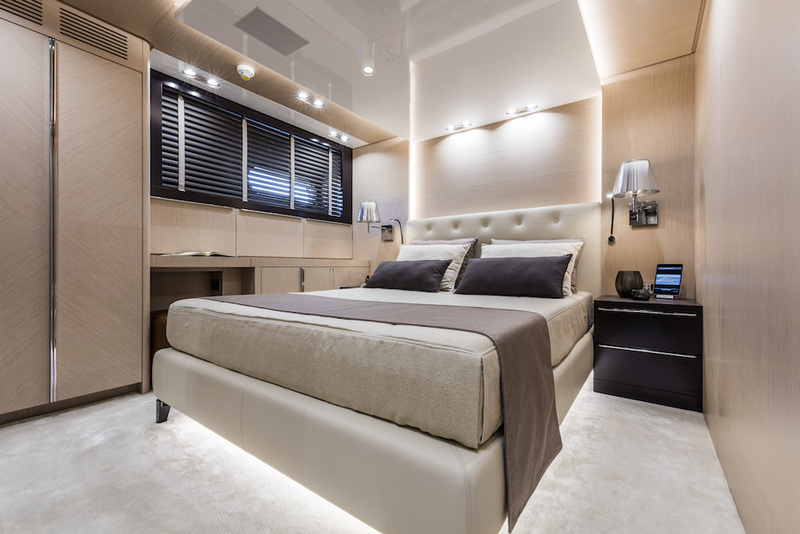 The fully-customizable interiors exploit the available space in the smartest way: the master stateroom, for instance, is laid on two levels, conveniently using the fore sections of main and lower deck. One of the key areas on board is the stylish sundeck, proper of a much larger superyacht: forward is the relaxation area with two built-in sofas located behind the windscreen and the starboard navigation bridge; on port side a wet bar is equipped with refrigerator, ice-maker, sink, and dumbwaiter connected to the galley. To starboard a large Jacuzzi offers total relax. Further stern, in the middle of the deck, there is the dining area with a tailor made table for 12 guests. The roll-bar acts as a sunshade over the dining area and allows guests to enjoy the fresh air sheltered from the hottest sun. In its upper part, besides the radar mast it supports a large rigid roof which provides shade to the comfortable outdoor dining area, furnished with two semi-circular sofas. 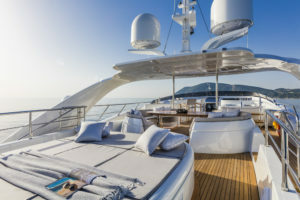 The aft deck, like the main deck cockpit, features a sun bad which turns into a sofa when necessary. 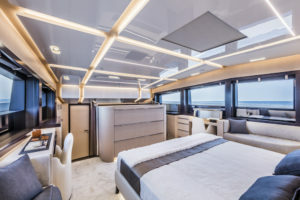 ‘Clorinda’ can accommodate 10 guests in five comfortable cabins, with the owner’s apartment located to bow of the main deck and laid out on two levels, while the crew quarters allows for a staff of five in three cabins on the lower deck. 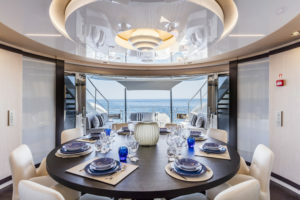 In addition, the expansive main deck salon offers a generous relaxing area with a large “L” shape sofa and, further on, the main dining area with circular table opens outward by way of six curved, sliding-glass doors. 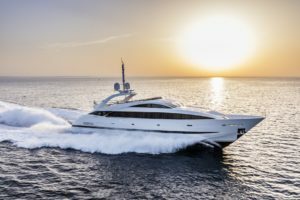 ISA Sport 120 ‘Clorinda’ is propelled by three MTU 16V 2000 M96 engines developing 1790 Kw each, coupled to 2 side KaMeWa waterjets and a middle KaMeWa booster. Maneuverability is then agile and smooth, with great performance matching an exceptional comfort. 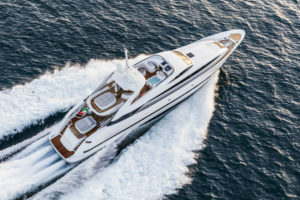 The top speed exceeds 34 knots, with a cruise of 27. Due to the constant R&D process, propelled by the cooperation among the Shipyard, suppliers and customers – whose advice is always taken into great consideration – ISA has developed and adopted on Sport 120 the ABT TRAC electric stabilizer. The benefits are immediately evident: the sophisticated yet quiet system grants an extraordinary reduction of pitch and roll, increasing the on-board comfort. 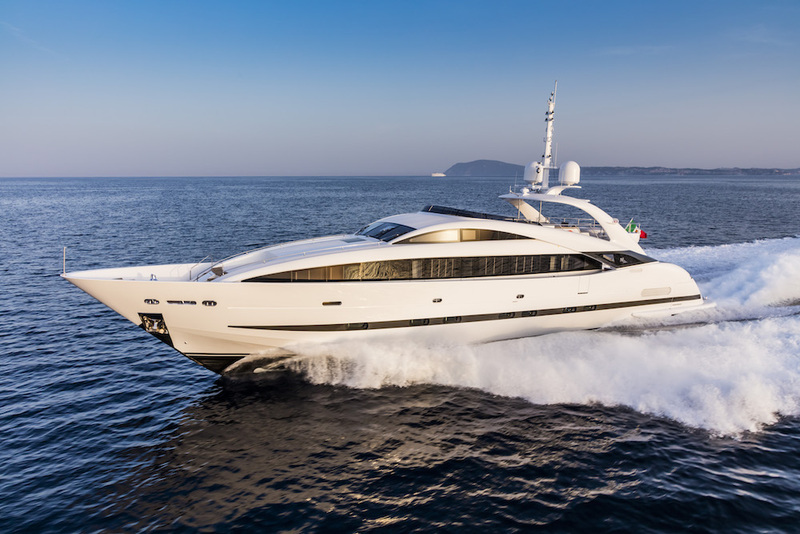 ISA Sport 120 can then be deemed the only yacht with such high performance to also feature large volumes, low draft, and exceptional stability in navigation and at anchor. 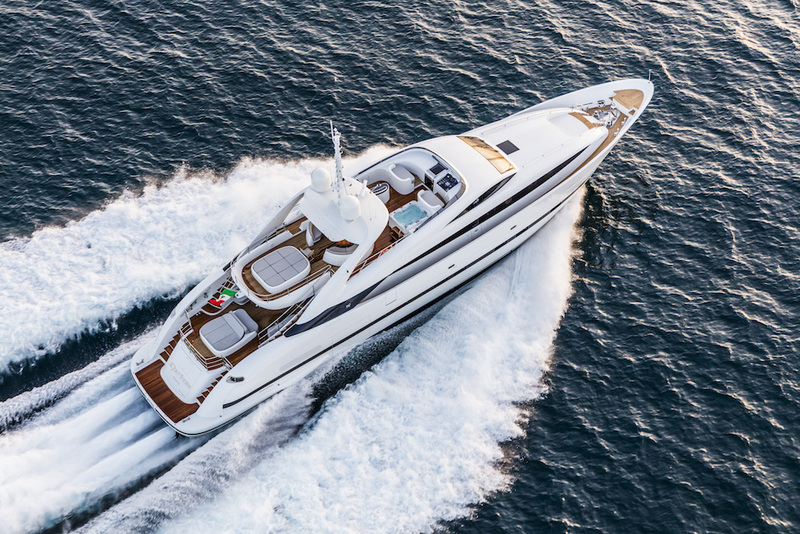 ISA Sport 120 is a model that strongly embodies the philosophy and the quality focus of ISA Yachts shipyard. She combines sporty and timeless elegance, exterior living space and rich interior environments in a particularly successful and appreciated model, awarded with the prestigious MYDA (Millennium Yacht Design Award).